Aki Kuroda is not necessarily limited in 2-D to express himself. Even though he was primary recognized as one of the most exquisite Japanese painter in the European art scene. Its impression was established internationally since when he signed up with the Gallery Maeght in Paris, the initiator of the modern art gallery and also patronized the remarkable artists such as Matisse, Miro, and Giacometti. This happened almost simultaneous with his first participation for the Paris Biennale. However, with his versatilities, and richness in sensitivity, he has involved with so many other media or method. For instance he directed the stage art of the legendary Russian ballet piece, Parade, which first performed in 1917 with the members of Jean Cocteau, a scriptwriter, Erik Satie, a music supervisor, Pablo Picasso as an art director. The current piece was for the Opera, Paris and for Avignion International Theater Festival in 1993. He also has been in charge of editing and publishing of an art-literature magazine, NOISE contributed by several philosophers and lately published art magazine, COSMISSIMO with more private concept. The works of such as Wim Wenders and Sonia Rikiel were appeared, collaborating with paintings of Aki Kuroda in pages. No doubt about Aki Kuroda being an artist who confront with himself through painting. But at the same time, he is the one who swiftly but accurately marks his footstep in such unpredictable world of art. 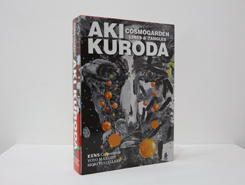 The current exhibition of his,Lost Garden at Mori Yu Gallery, in Kyoto is conceptually extended space from the previous theme of his, Cosmo Garden. With its theme, Proliferating garden and proliferating paintings, Kuroda is challenging the impact of 2-D paintings in the 3-D installation. Also humorous Kuroda's wit keeps activating in this garden. By him sending his drawings daily from Paris and each of then will be displayed one after another, Lost Garden shows its never ending proliferating. Galerie Georg Nothelfer, Berlin, Germany. Cosmogarden 5 The museum of Kyoto.